Want a film-spec Range Rover Sport fit For James Bond? Know where to find some shady, likely Albanian guys? You just might be in luck! Back in October, five modified Range Rover Sport models, among other vehicles and equipment including a Range Rover Evoque, were stolen from a preparation studio at an industrial park for the upcoming James Bond production, simply titled Bond 24 for the moment. News of the robbery has just been made public. Reportedly, the cars had just finished being prepared in Dusseldorf, Germany for shooting and were about to be shipped to an Austrian filming location before being stolen. There are no details of who the robbers are, or their intentions. The original article, which was translated from German, claims that the security of the vehicles was at risk due to European auto regulators. Details of the vehicles diagnostics and other systems have to be made available, making it easier for robbers to 'hack' the vehicles and steal them, according to the article. More details of the vehicles have slowly been leaking, with rumors that they were intended for an off road car chase through the Austrian forest. I'm pretty sure a few of the articles are assuming that the 'modifications' being made by the production crew would be practical and classic 'Bond' gadgets in the film, but it is more likely that they were being modified for the more physical and practical needs of the production crew. Typical modifications would be for filming equipment, improved safety, fragile material for dramatic effect (like shattering body panels and glass), weight enhancement, and possibly even more off-road capability. I'm also not convinced a gadget-laden Range Rover would actually feature on film, considering Bond's main ride will likely be the all new, never before seen Aston Martin DB-9 replacement. Film productions often have multiple identical vehicles they use in the circumstance of an accident, or for damage consistency in shot sequencing. For the filming of Skyfall, the stunt team had a fleet of Audi's with various amounts of sledgehammer damage to keep consistency while filming the chase that opens the film. If you film the car rolling over seven times, breaking a world record, and then realize you still need to film the actor getting into the car.. you're sort of out of luck. Keeping a few backups on hand is not uncommon, so it is likely only one or a few Range Rovers are actually planned to star in the cinematic chase. LR/RR and sister brand Jaguar seem to have a pretty solid deal with the Bond production company, Eon Productions. They have reportedly already offered over replacement models, as the Austrian production of the film plans to begin in January. The total amount of property stolen is rumored to be around EUR 800 000, or almost $1 Million dollars. 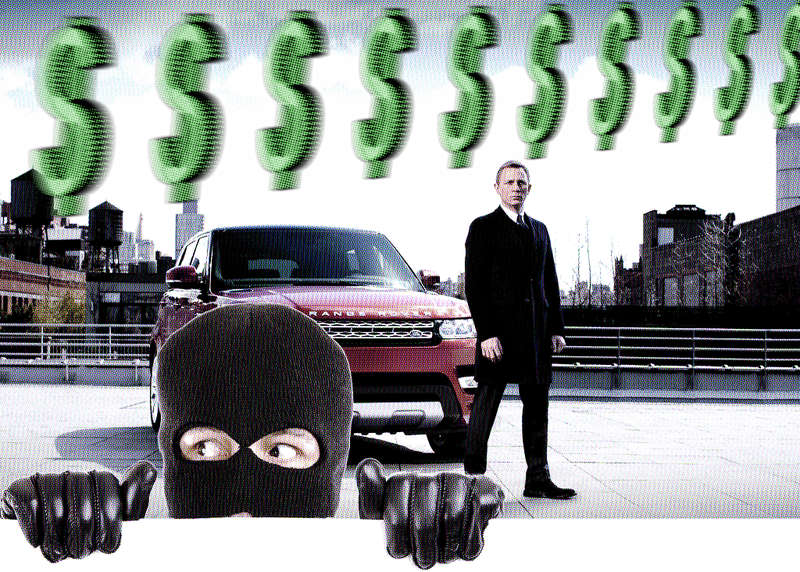 Speaking of a million bucks, they even paid current-James-Bond Daniel Craig over $1 Million to unveil the new Range Rover Sport at the New York Auto Show, and he didn't even need to talk! Eon Productions will be hosting an official press announcement Thursday, December 4th. It is expected for all of the main cast to be announced and present, as well as a title and a brief synopsis to be released. Filming should be good to go before the year's end. The new Bond adventure will be shot in Austria, London, Morocco, Rome, and Mexico. If you are over in Europe and find a great deal on a few Range Rover models, I wouldn't ask too many questions. Jeremy Clarkson would likely speculate the robbers to be Albanian, if that helps. Also, the car may be completely modified to shatter on direct contact for dramatic effect, but is that really abnormal build quality from the LR/RR brand? Justin Westbrook is a 20-year-old stressed out General Manager of a Jimmy John's sub shop in North Carolina, and spends his spare time watching James Bond movies, getting speeding tickets, thinking about going to college, and participating in "the internet."